4Word started life as a Facebook thread – proving that social media is definitely good for some things. The discussion concerned the frustration felt by many poets with the overcrowded fish pond that is poetry publishing. With so many jostling for attention, the standard advice of ensuring that you have a history of publication and competition wins is no longer a guarantee of even being noticed by harassed poetry publishers, drowning in tidal waves of manuscripts. In a world where the small presses receive more submissions than they know what to do with and the larger ‘establishment’ publishers could fuel a power station with their slush pile, doing it yourself seems the only way forward – or 4Word. And that is, indeed, how 4Word began – a social media thread which spawned an idea which became a reality as Stella and I first mulled over and then embraced the challenge of producing professional, high quality pamphlets, for ourselves and for others whose work we admired. We decided that we could manage four pamphlets a year and asked Kevin Reid if he would be our first invited poet. As a result of much hard work and a steep learning curve, our first three titles, with their beautiful and stylish covers (courtesy of Claire Jefferson) are now out and proud and due to be launched on May 1st. 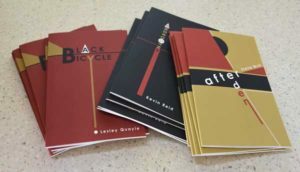 Androgyny by Kevin Reid, After Eden by Stella Wulf and Black Bicycle by Lesley Quayle. We hope to invite one more poet to join us later on in the year. Someone whose work we love, someone whose poetry definitely makes our toe nails twinkle! So nice to see the books together. Very proud of what we’ve achieved in a short space of time and really looking forward to producing our next pamphlet.